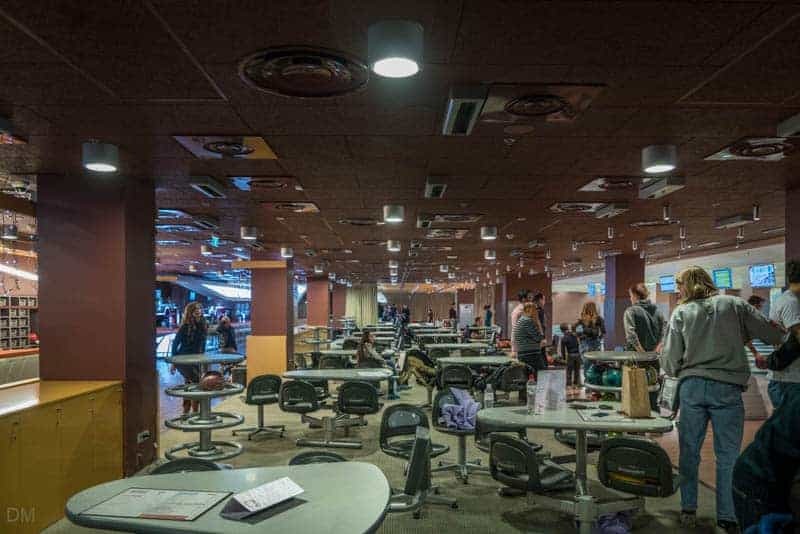 Gulliver Bowling is a modern, 24-lane bowling centre is Kiev city centre. It is situated within the Gulliver shopping mall, one of the tallest buildings in the city. Prices are very cheap for those accustomed to Western European prices. Rates are for the lane by the hour, irrespective of how many people are bowling. Lanes 1 – 8 offer comfortable sofa seating while lanes 9 to 24 are standard seating. Prices are more expensive at the weekends and in the evening. We visited twice in January 2017. On Saturday evening, the most expensive time, the price was 225 UAH for an hour for a standard lane. On Tuesday evening we paid 150 UAH for an hour. Prices on weekday mornings, the cheapest time, were 85 UAH per hour for a standard lane. The rates for the luxury lanes were only slightly higher. 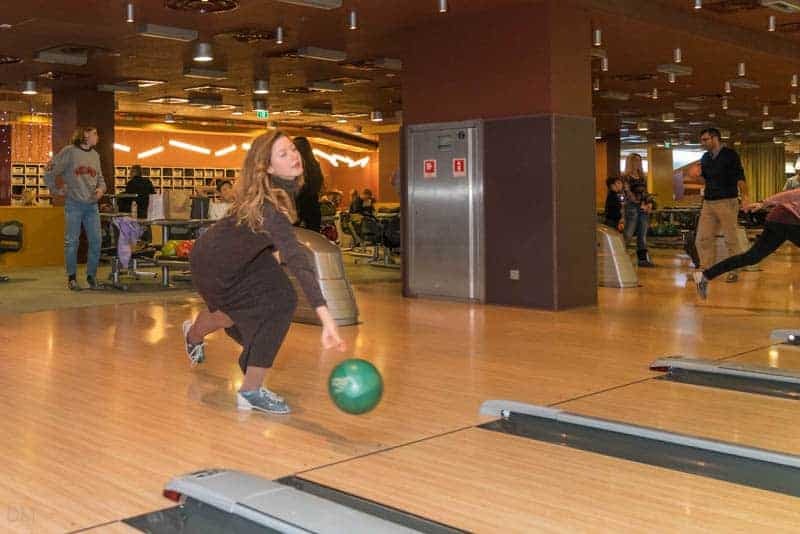 Gulliver Bowling is the best tenpin bowling centre we have visited in Kiev. It’s more modern and much more spacious than Dream Town Bowling. Lanes had a great selection of bowling balls and the shoes supplied were clean and in good condition. A food and drink service was available. Service was efficient and prices quite reasonable. We paid 27 UAH for a coke and 25 UAH for a mineral water. Bottles of wine were available at around 400 UAH and cocktails averaged 100 UAH. My only minor criticism was that the staff at the ticket desk didn’t speak any English. Fortunately I was with Ukrainians both times I visited and they took care of the booking. Gulliver Bowling is located on floor 5 of the Gulliver shopping mall in Kiev city centre. The nearest Metro stations are Palats Sportu and Ploshcha Lva Tolstoho. 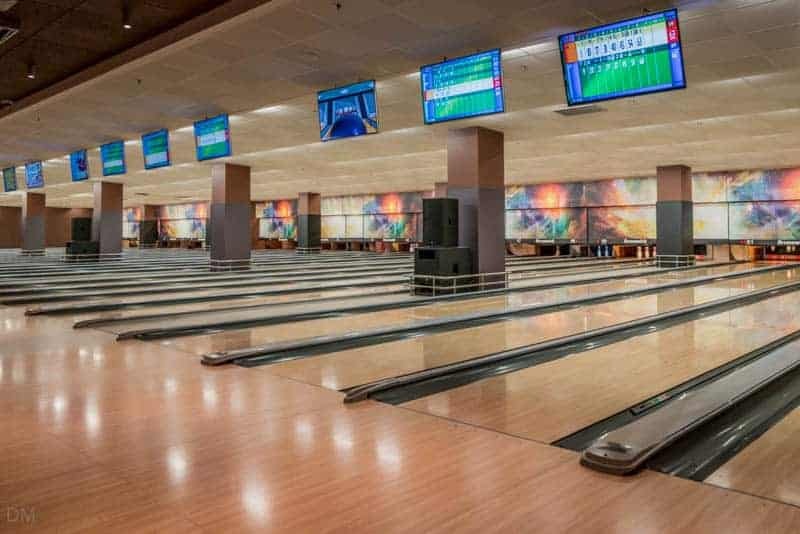 Visit Kiev Ukraine played at Gulliver Bowling in January 2017. Unlike most other most other Ukrainian tourism websites we pay for our own entertainment and write completely independent reviews. Map showing location of Gulliver Bowling. Tenpin bowling centre in the Obolon area of the city. Metro station on the Blue Line.